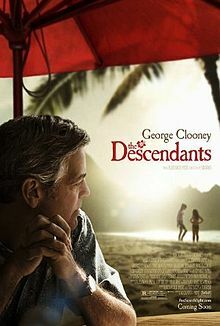 Making its U.S. debut at NYFF with four screenings, “The Descendants” is based on a novel by Kaui Hart Hemmings. It stars George Clooney as Matt King, a man suffering an existential crisis spawned by two different family events. (See trailer above). The first is the boating accident off of Waikiki that left his wife in a coma and him to care for (or vice versa) his two troubled daughters, 10 year-old Scottie (Amara Miller) and 17-year-old Alexandra (Shailene Woodley). The strong supporting cast also includes Beau Bridges and Nick Krause. Also challenging Matt is the impending sale of his family’s ancestral land. Passed down from Hawaiian royalty and white missionaries, the land is home to some of the last unspoiled acreage of tropical beach on the islands. Workaholic, but responsible Matt is the trustee. Matt's large extended family of mostly deadbeats must agree to sell the land if it is to further benefit from the property before a law forbidding land ownership through perpetuity takes effect. “The Descendants,” directed by Alexander Payne (“Sideways”), has a wider U.S. release next month and a review will be published to coincide with it. Other screenings today at NYFF include “Policeman,” “Ten Nights of Dreams,” “The Woman with Red Hair” and “Cold Fish.